Dreams and Drama: Another Blog award and am tagged again!! 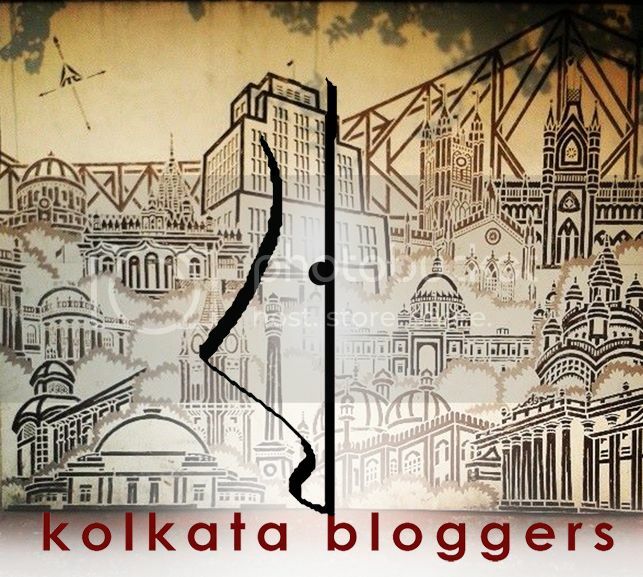 Another Blog award and am tagged again!! Favorite Non-Alcoholic Drink: As I said before,its tender coconut water. Next to it will be Masala Lemonade. Facebook or Twitter: I don't like either. But I choose Facebook coz I met some of my childhood buddies through it,so its special on sentimental value. My Passion: Reading books and watching movies. All genre for both. Favorite Flower: Orchids,purple ones. And yellow rose buds. Favorite Celebrity Role Model: Swami Vivekanada. I know,he isn't a celebrity but I have been awed by him and his preaching since I was a kid (no am not the philosophical kind). I visited his house (which is adjacent to my college) and the rock at Kanyakumari where he meditated and I did find peace. I don't believe in miracles and divine stuff (I do believe in God though) but strangely enough,I felt a weird unexplainable energy run through me when I went to these places. I found myself at rest,complete peace. 1) I am a Bengali by birth. But am an exception coz I don't have a sweet tooth which almost every other Bengali has. 3) I can speak fluently in 4 languages - English, Hindi, Bengali and Malayalam and read and write in 3,the first 3 mentioned. And thanks to my cosmopolitan schooling,I can fairly understand many others. I am planning to learn French,Spanish,Chinese and Persian in the future. 5) My favorite subjects are Genetics,Mathematics and Anthropology (yes,that is what Bones did to me :D). Sadly,am not studying either of the three!! Don't ask me why!! 6) I am a self-confessed bookaholic, chocoholic and cinephile. I love classics. 7) I am an impulsive buyer most of the times and I do regret it at times. 11) Am a crazy punch of a hopeless romantic and a very rational empiricist. Most of the times,my brain i.e. my rational self wins the battle. Ah thats enough from me!! 1)Salon treatments with not so famous brands/ DIY home spa treatment with luxury brands? 2)Internet connection you are using? - I love Lacoste's Touch of Pink but I usually use Adidas Pure. 5)You mostly shop for- makeup/outfits? - I don't use too much of make up. But mostly i buy Maybelline and Lakme stuff. Clothes,no particular brands as such. 7)What do you love about my blog( I presume you read it!)? 8)Are you a dog lover? 9)Makeup Products you love (mention shaded) ? - I don't use too much make up apart from Kajal (Maybelline's Collossal kajal), lip balm/gloss (usually Avon or Maybelline stuff) and nail colors(all kinds,no particular brand). Does Sunscreen fall under make up?? If yes,then I use VLCC's SPF 50 Sunscreen lotion. 10) Products you regret buying? - A few lip sticks. I never used them,so had to giveaway to my cousins. And then a few earrings which are too big,I had bought them on my famous impulses. 11)How much time you spend on your blog(includes visiting other blogs) on an average day? - Around 3 hours everyday. Sometimes even more. - yeah,tried it when I was a kid. - Saw The Magdalene Sisters some time back and really liked it. - That I can be quite shy at times despite being an extrovert. - I like to keep myself occupied doing something productive,even if its something as small as blogging. Phew. This is turning out to be a very very long post. 1) Opal of Girl with a Pearl Earring. wowza! so much information all in one post. i can definitely say i learned a lot about you from reading this. i also love dogs and am not a big fan of stilettos. i wear heels, but they can get uncomfortable easily. i prefer wedges and flats. blue is also my fave color. thanks so much for giving me this award and tagging me! btw what is this for ? 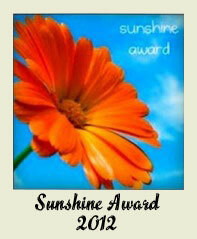 sunshine award or tag-o-mania ? You speak FOUR languages?!? I'm very impressed and a bit envious. I only speak one. I tried learning Spanish in college, but never had anyone to practice on and eventually forgot it all. Haha! Every Indian (I am counting the educated ones) here knows a minimum of 3 languages-English-the official language, Hindi-The national language and their mother tongue (which happens to be Bengali in my case). I know Malayalam coz I spent 8 years in Kerala. Yeah,you are right. I am already loosing my fluency in Malayalam as I don't have anybody who understands or speaks Malayalam here. And thanks for visiting over! BTW i love your cover picture. Thats just amazing! Thank you soo much Swarnali!!!! Lots of questions to answer :-) And I think this is the first time I'm hearing of a Bengali who can speak Malayalam fluently!! You have an amazing knack for languages!! lol. yes, they do behave like they are English! I agree,it happens here as well...people take pride in speaking a language which is not their own and when I say that am proud speaking my mother tongue,am mocked as I study English and not Bengali. Accept the award and do a post the way i mentioned in my post and pass on the award to 10 other bloggers and tag 11 other people you know on blogsphere and ask them 11 questions.Just follow the instructions. Do a thing,just put up the award and say I tagged you as well and answer only the questions I gave you. And then tag and pass on the award to 11 other bloggers you know and put up the rules of the tag and the award.Ok?? So lovely to learn more about you! I love reading people likes and dislikes! I hope that you do get a chance live your dream of scuba diving/bungee jumping. I have been paragliding twice (i.e. gliding in the sky with a big kite typa thing not attached to anything) and I think you will love it!! Its not scary at all....you just feel like you are floating gently above ground looking down on the world. You have to try it! Congrats on the award! I love getting to know you better. Thanks for dropping by and following me. People used to think that i am a mallu until I told them that am a bong(both in Kolkata and in Kochi). :D Sadly,I have lost quite a lot of my fluency in Malayalam now after coming to Kolkata but still I can speak Malayalam fairly well. Awe thank you so much Swarnali! All your answers are so fun and playful. It was fun to learn more about you!! You speak Malayalam like a malayali?! That's awesome! I can't stand it when non-Mallus murder my language by trying to speak it. I really like it when people make an effort to learn and speak in a new language but murdering it intentionally is something I really hate. Guest Post 4 - Meet Amber ! !